GAYLORD, Michigan — It’s a rainy, sub-40-degree day in early October, the kind of cold, damp morning that makes you want to pull the covers back over your head and fast-forward to May. Most days, that is. Today, a date with the 7,028 yards of a glorious green golf course called the Masterpiece at Treetops Resort awaits, and neither rain, nor sleet, nor snow (or in today’s case, all three) could keep me away. Sound crazy? Guess again, friend. This place is packed. While most happy hackers would retreat to their basements on days like today, not much can keep people away here. 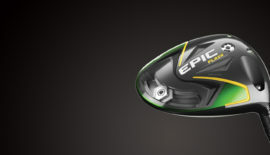 It’s that kind of rabid loyalty that has kept Treetops at the top of so many golfers’ wishlists year after year. With five fantastic golf courses, five restaurants, full-service spa, conference center and recently renovated Lodge and Inn rooms, it’s not hard to see why. 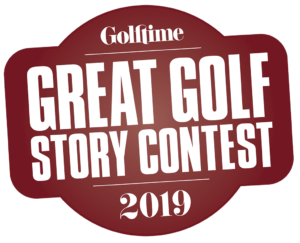 We heard loud and clear from that fan base last year, as Treetops cleaned up in the first Golftime Magazine Best of the Midwest Awards, winning Best Course in Michigan (the Rick Smith Signature) and Best Value in the Midwest (unlimited golf stay-and-play packages start at $99). 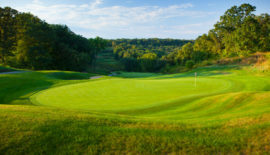 Treetops is the unquestioned crown jewel of the Gaylord Golf Mecca, a 15-member collection of courses in the region that earned it the award for Best Golf Destination in the Midwest (see sidebar), and deservedly so. 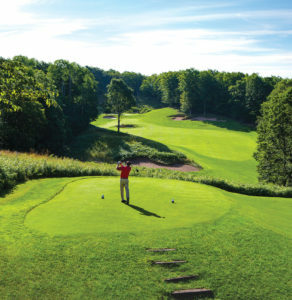 You’d be hard-pressed to find a place so perfect for the quintessential “Up North” golf experience, with towering hardwoods, dramatic elevation, and stunning golf design from some of the game’s greatest architects. And it all started here, at the resort an automotive mogul named Harry Melling created when he bought the Sylvan Nob Ski Area back in 1983. Melling had a vision to turn the little ski hill into a resort, and then a golf resort, and then making it a full-on, four-season destination, back when there were painfully few such things in the Midwest. By 2001, when it hosted the televised Par-3 Shootout, Treetops had gone even further, becoming an international golf destination among the best in the world. The signature hole and inspiration for the resort’s name, the 180-yard sixth hole on the Jones Course. He and the late, great golf architect Robert Trent Jones Sr. started it all in 1988, when they opened the Masterpiece, a truly fitting name if there ever was one. Hot off the success of the first course, Melling moved quickly to add others. He tapped Tom Fazio to build the Premier in 1992, and gave his brash, young golf pro named Rick Smith the chance to try his hand at design that same year: The result was Threetops, considered by many the best par 3 course in the country. Seeing what Smith could do, Melling ordered up a sequel, and Smith’s Signature opened in 1993. The Smith-Melling collaboration continued with the resort’s fifth course, the Tradition, in 1995, as well as a golf academy and training facility. Melling died in 1999, but his legacy lives on here. Today the resort offers far more than golf to make it one of the game’s premier destinations. Melling expanded the original lodging from a 40-room inn, to the now 238 varied guestrooms, chalets and condos. Treetops added a 10,000-square-foot conference center, a full-service spa and a children’s center. Golfers, skiers, and families all came in droves. But like pretty much everyone else in the industry, Treetops didn’t escape the recession unscathed, and filed for Chapter 11 bankruptcy in 2015. It emerged with a reorganized ownership, a vastly better balance sheet, and the same rabid following from golfers across the Midwest and beyond. Treetops has proven too big — and too beautiful — to fail. Owens, now in his 12th year at the resort following several years at nearby Garland Resort, has seen his share of highs and lows in the industry. But he says the state of the resort and the region is as strong as ever. But while it’s obvious there’s plenty keeping the place packed year-round, we came here for the great golf, which the resort offers in unbelievable amount. You need look no further than the first tee of the Masterpiece for Exhibit A. Following a “warmup” round on the riotous Threetops the night before, the Masterpiece is a thrill-ride from start to finish. The opening hole, a serpentine, 525-yard, par-5 stunner that finishes with a pond-guarded green, gives you a good shot at birdie off the bat. Other highlights on the front include the 201-yard, par-3 fourth hole, which was built in the early 2000s to accommodate new condos, and the Signature’s signature hole, the 180-yard (straight down! ), par-3 sixth. This fantastic par 3 offers limitless views across the Sturgeon River valley, and is also the signature hole for the resort. Legend has it Melling and Jones Sr. stood atop that tee and Jones said, “all you can see is treetops.” The resort had a new name from that day forward. 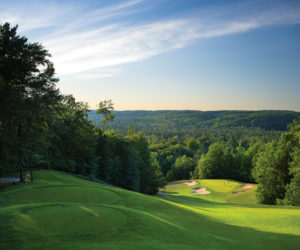 The back nine starts with the colossal, 600-yard, par-5 10th, and if you ever reach the elevated green, turn around and marvel at the panoramic vista around you — Pure Michigan at its finest. Treetops’ courses sit on a whopping 1,500 acres, and it shows. The finishing stretch is special, with the 363-yard, par-4 15th and 152-yard, par-3 16th offering great birdie opportunities, before finishing out with the wide-open, par-4 17th, and tight, tough, 579-yard, par-5 finale. The Masterpiece proved to be every bit as excellent as advertised, but there was plenty more where that came from. Following a mouth-wateringly wonderful Kobe beef burger in Treetops’ highly-rated Sports Bar, the Tom Fazio Premier beckoned. Fazio, one of the game’s greatest architects, has painfully few designs in the Midwest, and the Premier is his only design in Michigan. 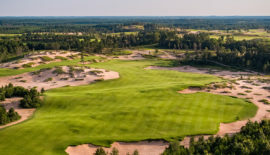 The course is quintessential Fazio, however, and playing out over 6,832 yards of Northern Michigan splendor, the Premier is far more pretty than penal. The architect focuses on the ebb and flow of the course, evident from the elevated tee of the dogleg-right, 431-yard, par-4 opener, easing you into your round. The reachable, 517-yard second hole is another great chance to start strong. 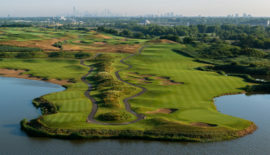 The Premier packs plenty of bite, of course, which you’ll find in the heavily bunkered, uphill, 421-yard, par-4 third hole, and the skinny, 373-yard, par-4 seventh. The beautiful back nine is highlighted by the 195-yard 11th, wrapping around a large lake, and the go-for-it-gorgeous, 362-yard, par-4 15th. Not surprisingly, Fazio saves his best for last, with the dramatic, 471-yard, par-4 finisher, complete with beautiful bunkering to heavily guard the narrow green. As the years have gone by, the course has been overshadowed a bit by the Masterpiece and the Signature, but Fazio’s Premier is pure premium grade golf design. After a cold, wet day on the course, a hot meal in the Hunter’s Grille, offering Treetops’ finest fare, was just what the doctor ordered. A heaping helping of clam chowder, followed by the apple-spiced pork loin entrée was the perfect end to an exhilarating day. Then it was off to the comfort of my pillowtop mattress back at the newly renovated Lodge for an early evening. Dawn awaited, and Treetops’ Grand Finale with it. 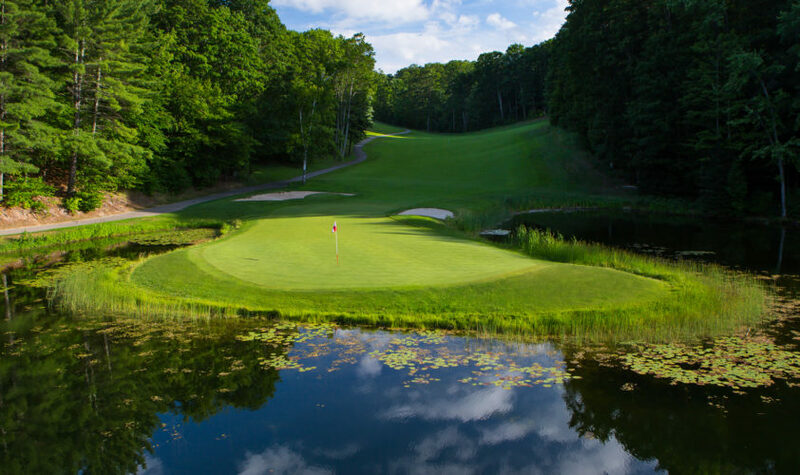 The Rick Smith Signature course was voted the best in Michigan by our readers, which is a pretty bold statement with the number of worthy competitors the club faces. But after a round here, it’s clear you won’t find a finer example of Pure Michigan, “Up North” golf anywhere. The Signature has it all: dramatic elevation and limitless views, towering hardwoods and sleepy pine forests, shaggy bunkering and classic course design. From the start, a 447-yard par 4 that plays downhill to a postcard green, you know you’re in for a treat. For further proof, consider the club’s five fantastic one-shotters. The first of the par 3s, the 186-yard fourth, is reminiscent of Crystal Downs, tucked away in the pines like you just stumbled on it in the forest. The front’s awesome, 190-yard eighth is another highlight. The back nine’s highlight reel includes the 556-yard, par-5 10th, and the wide and wonderful 485-yard, par-5 15th, which narrows in the neck and plays uphill to an amphitheater green, kicking off a spectacular finishing stretch. PGA staff professional Mark Hogan shows the way on the Signature’s 18th. If you don’t say “Wow,” when you turn the corner to the Signature’s sweet 16th, the dramatic, 368-yard, par-4 thriller, you’d better see your doctor immediately. That sets up the last of the club’s pretty par 3s, a tough, 217-yarder that drops off all around it. Smith’s finale is another thing of beauty, and before you hit from the elevated tee, turn to your right at one of the best views on the property. The uphill, 363-yard, par-4 18th offers risk-reward off the tee, forcing you to place your shot perfectly for the best look at the uphill green. It’s a fantastic finish for a special course, one worthy of all its accolades. We didn’t tackle the Rick Smith Tradition this trip, which was already packed-to-the-gills with great golf. That just shows how incredible a collection Treetops truly has, and gives us another reason to return. Visit www.treetops.com for more information.